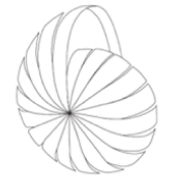 The Nautilus is a symbol for endurance and longevity, The Nautilus through its life keeps growing and expanding in a perfect example of a logarithmic spiral and has been used to show expansion and renewal in art. The colors used in the logo are deep ocean blue and earthly green. These colors are used to map the span of the group from marine activities to inland, lt also reflects a deep attachment to the environment that Tattva carries. 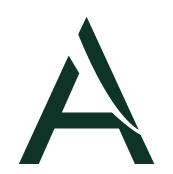 The sliver that separates the various sections of the logo is transposed over the ‘A’ of the typeface, This accentuates the tip of the ‘A’ making it a symbol for progress and also makes the type unique. Tattva is a Sanskrit word, derived from a combination of two words- Tat, meaning That and Tvam, meaning Thou. Tattva literally means ‘Thatness that is you’. An abstraction of its meaning is ‘Being the Essence’, a powerful thought that underlines The Tattva Group’s existence. It is visually represented by a colour gradient nautical shell symbolising a transition from marine to land, much like the Group’s business interests. Every decision, initiative and plan at Tattva is viewed through the lens of its core value base – Entrepreneurship, Integrity and Innovation. 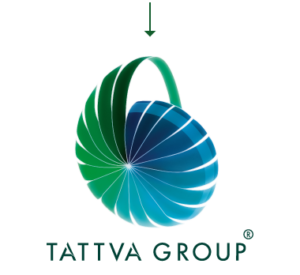 Everyone at The Tattva Group is encouraged to put on their entrepreneurial hat and take the company forward, as they would at their own company. This sense of ownership helps in achieving our goals with ease. The ethos of The Tattva Group is one of credibility and consistency in an environment of mutual trust. The Tattva Group understands the importance of staying relevant. The Group embraces the dynamic nature of business and pushes its employees to initiate as well as adapt to change. We will look to build leadership positions in chosen areas and continuously enable value creation. We will attract the best people, focus on our customer requirements and enthusiastically promote innovation and creativity at all levels.